I have been able to add up to 1/4 of the flour as whole wheat and still have it come out great. If the stone is preheated with the oven and really hot, the crust should cook w/o worrying about adding the cheese later. I have been using pizza stones for just a year now. I gave up on the peel… mostly because it was difficult with the raw pizza. I assemble the pizza on the stone quickly and just use a big spatula to remove the pizza. Along with bread, breadsticks and oven fries work great on the stone. We have found, through tons of trial and error, that a bit of cornmeal sprinkled on our peel will help the pizza slide onto the stone. We always preheat our stone and my husband usually tops the crust on top of the peel. I have not frozen dough yet, but I hear that you should roll it into a ball to freeze it. I’m going to try that soon. Good luck. We eat homemade pizza every week and love it! I just did homemade pizza on my pizza stone for the first time this week too! I use to faithfully buy a frozen pizza each week for our Friday night ‘treat dinner’. Mom didn’t have to cook, it was something even Dad could do (he loves pizza more than the average child). But the prices on pizza started skyrocketing and I was getting stuck with the generic version that was just blah! I made my dough and then rolled it directly onto the stone. It got a little tricky when I realized I should probably flip the dough and flour both sides. Hillary – I almost always use TJ’s dough. Of the store bought variety they tend to come out the best I have tried (better then Stop and Shop, Whole Foods) and it brings the time down from making pizza “from scratch” significantly. I always aspire to make the dough in large vats and freeze them to be used at a later date, but that never seems to happen. — have all the toppings ready before you toss or roll out the dough and place it on the cornmeal dusted peel. the cornmeal works like ball bearings really well, but assemble the pizza quickly once it’s on there–it’ll slide off great. –my favorite homemade crust recipe is a peter reinhart one, but a close second, and really convenient one is the “artisan bread in 5 minutes a day”–you can keep a container of no-knead dough in your fridge for a couple of weeks and use it whenever (no thawing or raising time). i’m not dissing on TJs, but if you want to do homemade, that one is really easy. sorry, i have a lot of pizza opinions i guess. I have to brag about my homemade pizza. I don’t use a peel but I’ve learned to preheat the stone and then just get everything on there as quick as possible. Just have it all ready to go before you get the stone out. 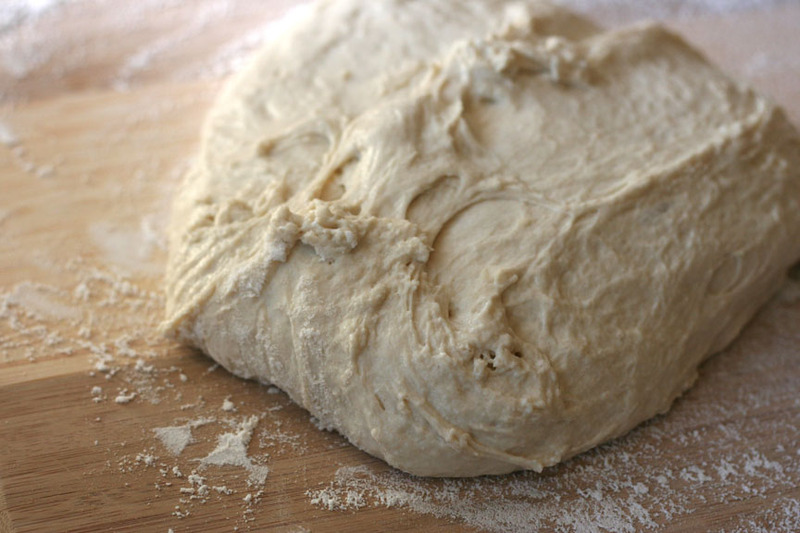 I got the basics of the dough recipe from a friend– Erin Russell who was an amazing cook. This is probably my favorite pizza ever. love all your comments and tips! as for frozen dough…I think I’ll just do it in balls like you mentioned, tracie. seems like the safest route to take. 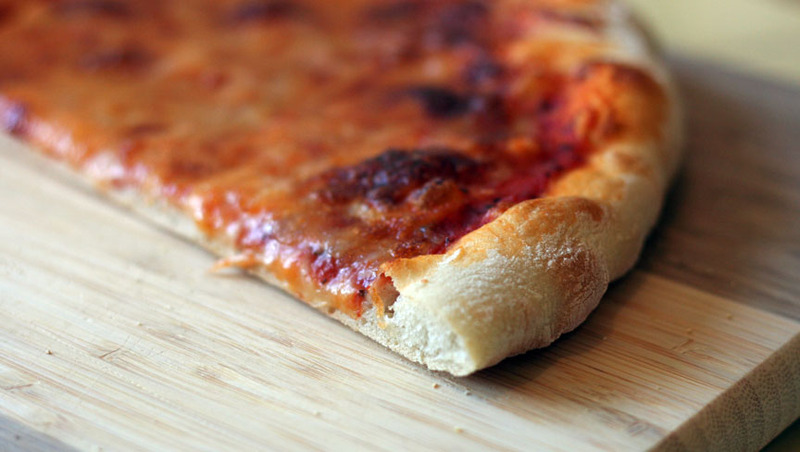 bear@cooking…love that about your 10-year-old requesting the homemade pizza over eating out! big time score!!! YES…I DEFINITELY use the TJ’s pizza crust, quite frequently actually. I like it a lot and it’s so easy…but I must say the homemade is just better, so if I’m feeling up for a little extra cooking (like I was this night) I do that…and now that several of you have shared some tried and true recipes, I’m going to try those as well. thanks everyone! as always, keep the comments coming – they are so great and helpful! Someone may have said this, but one idea that helps for transferring the pizza is to just make smaller pizza. It slides off easier and stays more intact. I have two stones and usually just heat them both, each with a not-humongous pizza on it. Good luck! Oh my my! That looks so good. I want to eat it right through the computer!! I LOVE homemade pizza! We use this recipe (linked below) for our crust. It also has sugar in it. You can toss it into the bread machine to mix, but i’ve adapted it for my mixer and it still comes out the same. As a family who makes a lot of pizza, i’ve learned a few tricks. -bake only the crust for a few minutes to prevent the soggy sauce and cheese effect. -i do freeze my dough. I roll it out onto a pizza pan and bake for 3 minutes. Remove, let cool and wrap with saran wrap and foil onto the pizza pan. It gives it stability in the freezer. good luck, homemade pizza is the best!! I make pizza on a regular basis, so I guess I’ll throw in my 2 cents. 1–You shouldn’t have to put cornmeal on the stone, just the peel. When the pizza is done I’ll use a fork to grab it and pull it back onto the peel. 2–If I put enough cornmeal on my peel the dough never sticks (even if I let is sit and raise a bit while I prepare the other pizzas). 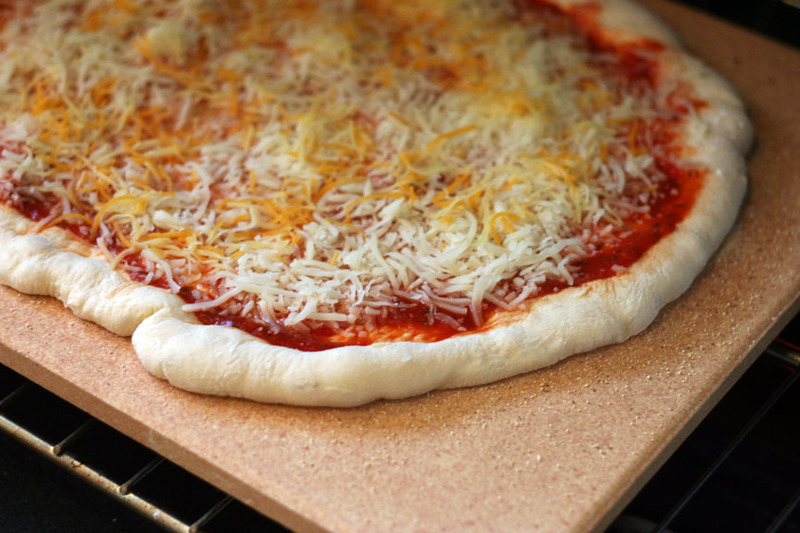 3–Your pizza looks FANTASTIC for your first time sliding it onto the stone. Congrats! 4–When I use fresh mozzarella on my pizza I’ll add it when the pizza is halfway done. Otherwise I always put the cheese on before putting in the over and have never had a problem. 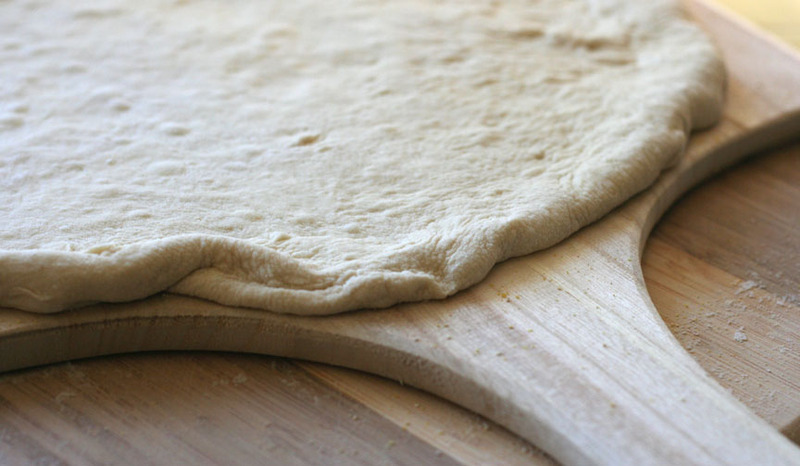 5–I use the pizza dough recipe in the book that came with our cuisinart. It is SO easy and SO delicious (has a bit of sugar in it). I separate it into 3 pieces because we prefer a thin crust. 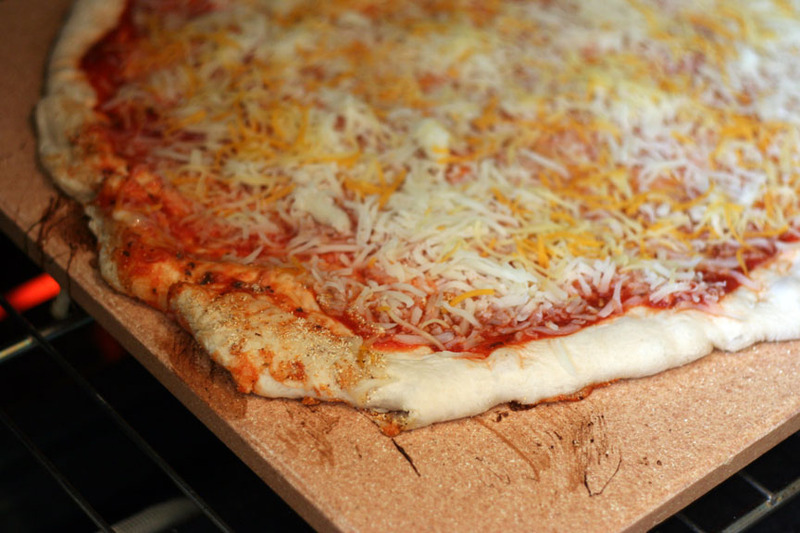 If you’re baking pizza on a stone, you are trying to replicate the pizza you get out of brick pizza ovens. Of course, in a conventional oven, this is usually impossible as brick baking ovens hover between 700-900F, and the average home user’s maxes out at 550. All the same, crank your oven as hot as it will go with the stone in it and let it sit there for an hour before you go anywhere with a pizza near it. Also, if you are going for a more authentic crust, you would go buy an Italian 00 flour for pizza dough. I use a blend of 1 c. cake flour to 2.5 c. AP to lower the gluten level. I’ve heard adding a little bread flour brings some chewiness, so I’m going to try that. The take home message here though is that a rocket hot oven is essential! P.S. with your oven that hot, your pizza will usually cook within 4-6 minutes. When I bake for my family, I usually make 4 or 5 smaller ones so they are easier to get in with the peel.